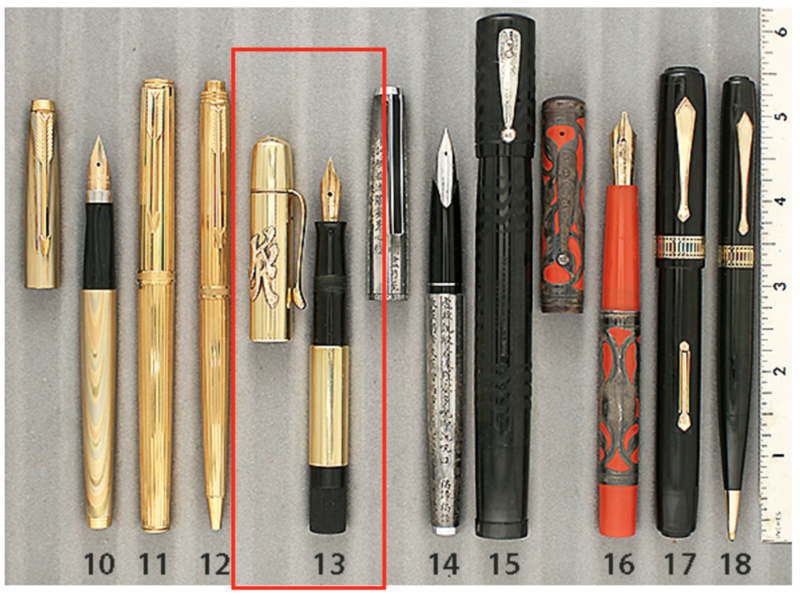 This 1933 Pelikan 112 Piston-filler in 14K has a pinstriped and wavy line panels design. The barrel is visualated in amber celluloid. This is one of the rarest of the early Pelikans! The cap is adorned with applied 14K fancy repousse “KK” initials. How did I come into possession of this pen? I acquired the pen out of Poland and was told of a very interesting provenance. The pen was used by Baron Leopold Kronenberg, member of the famous Polish family of railroad tycoons and bankers, and Michal Stanislaw Kossakowski, a Polish landowner, diplomat and banker, from the noble family of Polish-Lithuanian roots, at the occasion of the signature of an important partnership contract, hence the “KK” initials on the pen. I could not find anything specific to this agreement on the Internet, but it is consistent with their both being important bankers in the early 1930’s. I wonder if there were originally two of these, one for each of the partners!?! This entry was posted in Vintage Pens and tagged Catalog, Catalogs, Extraordinary Pens, Pelikan. Bookmark the permalink. Follow any comments here with the RSS feed for this post. Post a comment or leave a trackback: Trackback URL.